An attempt to fill in the blanks in iCal's feature set – but does it deliver? 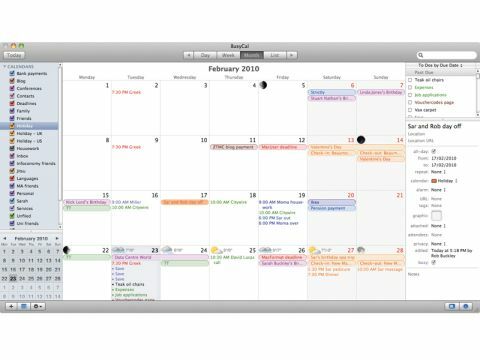 Most people use iCal as their calendar software, since it does most things well, has plenty of features, synchronises with MobileMe and portable devices, and comes for free with OS X. However, it does have its limitations. BusyCal is intended as an 'iCal Pro' for people who want what iCal offers but need more features. Its advanced features are to do with synchronisation: it can synchronise your calendars with Google Calendar and it can synchronise and edit the calendars of any Macs also running BusyCal. These features will be useful for some people, although we found BusyCal's Google Calendar synchronisation too buggy and lacking in user-controllable features. Most of the program's strengths are in improvements to iCal's feature set. It has a list view, sticky notes, and the option to customise fonts and colours for individual events. To Do's appear on the calendar on the date they're due and they can be set to recur at intervals. The Info panel can be docked, there's a menu bar item, and you can have the weather and phases of the moon show in the calendar. BusyCal does lack some iCal features, such as CalDAV and read-write Exchange support. Since it stays in sync with iCal, your iPhone, Entourage et al using OS X's SyncServices, you can use BusyCal and other programs at the same time to fill in the blanks in their feature sets. The program does have some useful functions, but at over £30, BusyCal will be seen by many as overpriced.